READ THE INCLUDED READ ME FILE AS THIS CONTAINS IMPORTANT INFORMATION REGARDING THE WORKINGS OF THIS MAP. QUERIES RELATING TO INFORMATION PROVIDED IN THE READ ME WILL BE IGNORED IN THE SUPPORT FORUM. Welcome to Yorkshire Counties, a Fictional Map based on the UK area of Yorkshire. With tight roads and an even tighter Timetable this map will challenge even the most experienced OMSI Driver. 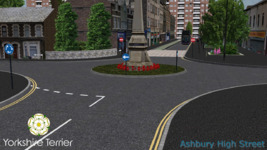 The map gives Drivers the challenge of assessing corners before navigating them designed to simulate real life challenges surrounding UK Roads. 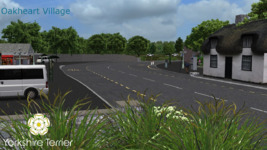 Throughout the map Drivers can experience Towns, Villages and Country Lanes as well as Ingleborough Sea Front & The New Peak District. There is also a NEW Rail Replacement service on the map that you are able to drive and stops at the maps train stations with a non stop service in between. Several Changes have taken place since the previous version was released including asset optimization and the complete re-working of several key areas such as Grainsthorpe, Windhaven, and the now formally known as Charlotte Village (Oakheart). Depot Runs are implemented into the timetable too from start and end of service, so keep an eye out for them. Whilst there are spawn points in the game for added realism why not start and drive from the depot out of service following the route markers. Choose from several displays such as Driver Training, Maintenance, Keep Connected and the classic Not In Service. A Few Easter Eggs are also in the game but i wont ruin them for you and pay homage to some of the communities best developers. DISCLAIMER: Even though the map is tested I cannot test every season, every time, and every second of things that effect the map so you may experience some intermittent (but not map effecting) bugs such as unusual AI Activity and buses de-spawning randomly. This is unfortunately an OMSI issue and is something i cant help. However feel free to use the twitter link to tweet pictures of unusual activity you experience. If there are any game breaking bugs please check back to the map download or support forum before rating the map down as these will be looked into. Please note: Snow textures have NOT been implemented into Yorkshire Counties as this was not something i felt was worth delaying the project for. Future maps may look into this but for this map..it is advised you TURN COLLISIONS OFF and DO NOT use Snow weather settings during gameplay. This map is NOT to be hosted anywhere else but on Fellowsfilm.com under any circumstances whatsoever. 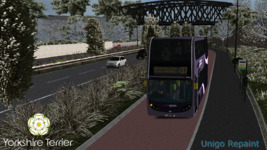 This map is a standalone map and is NOT to be advertised as part of a Virtual Bus Company Exclusive or in any aspect as part of any advertising campaign in order to promote a Virtual Bus Company without express permission from myself. This map is not restricted to nor associated with any specific Virtual Bus Company. 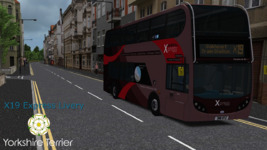 Whilst you a free to use the map in a Virtual Bus Company, i ask kindly you do not falsely advertise my map on it as part of your Virtual Bus Company. If used as part of any Virtual Bus Company a link to my map MUST be provided. Thank you so, so much for downloading Yorkshire Counties and i hope you enjoy the map. I love this map. I haven't done every route, but will do at some point. My only problem is the time to do the route in. Like the U37 is 58 minutes long, and im finding myself 20 minutes late be time I get back to the university. Maybe that could be something to improve in the next update? Also, maybe a slight improvement in the traffic lights as well? But its a brilliant map! Vastly improved over the previous version. It's got to be one of the best maps I've seen yet. The only problem I've found with it is the poor AI routing. 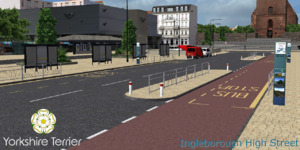 Cars will wildly zig zag across the dual carriageway and will also enter the bus terminus at Ingleborough High Street. Stunning looking map, nice varied routes, fantastic all around. Only criticism is the lack of integration for single deckers, but it's so minor, it doesn't effect the 5* rating. Great map, thanks a lot. Myself love the map would of liked the seafront to stay how it was agers ago as loved the bus stops at the seafront and love driving on them tight roads out of the seafront other than that perfect and really enjoy driving it i only use this map its great please keep making new routes and please keep up the good work love it dude Thanks for releasing to the public and sharing your creation much appreciated. 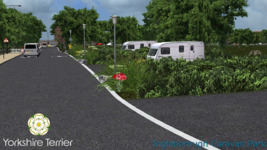 Ok, so I downloaded the map and so wanted to leave a 5* review because the map itself is fantastic, detailed, challenging and is a UK route which with London seemingly never happening, this route is without a doubt the best UK route. this map is so worth the download and is probably my fave route in Omsi to date. However, my first experience on the route was to drive into an invisible wall! so I have had to turn of collisions, whilst this itself is not a massive issue for me it does reduce the amount of money I can earn on Bus Company sim. Maybe I am doing something wrong, if I am I would happily give this 5*, I would give it a 10 if you could. Hey LT-GAZZ so we are working on collision testing in the patch hopefully and as the read me says it is advised to drive with them off. 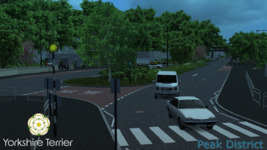 It was never intended to be in BCS as the road map didnt work but given the success and demand PeDePe wanted to add it and we finally generated the route map. Thanks for the review and the Collisions will be worked on in the patch to coincide with its addition to BCS Hopefully.